Cute, sassy, and sometimes hisses at people when she’s left on. Kids love her, though. 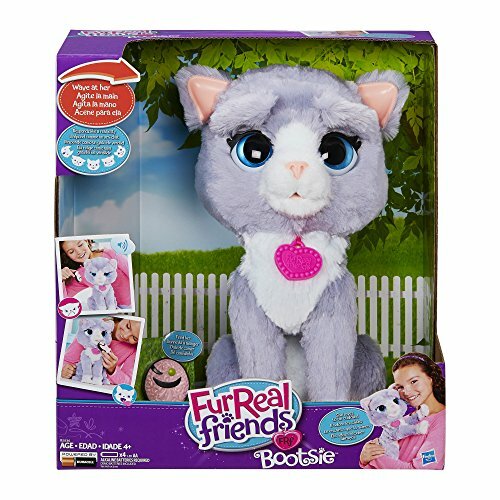 Bootsie can help fill that void for kids who can’t have a real cat. Her fur is soft, her purrs are soothing, and her hisses teach kids that they can’t just do whatever they want. 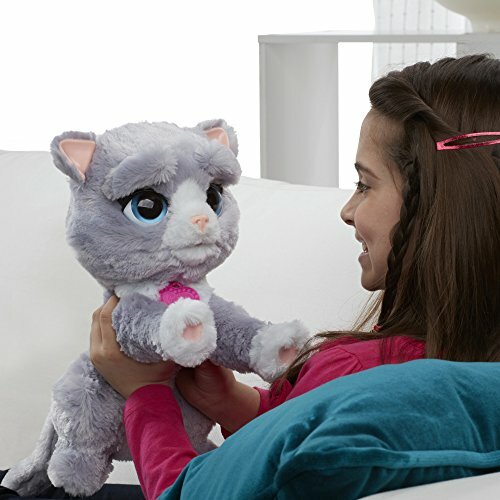 Comfortably laying over a shoulder or resting on a lap, she quickly becomes a favorite toy. While not as cuddly as expected due to the hard plastic parts protecting the electronics, kids don’t seem to be put off in the slightest. The one real complaint that keeps coming up is in regards to Bootsie’s unsettling habit of hissing at people when they walk by. This is because when Bootsie is left on, she’ll go inactive after being ignored for a few minutes, but will instantly respond with a hiss or a meow if her movement sensors are set off. 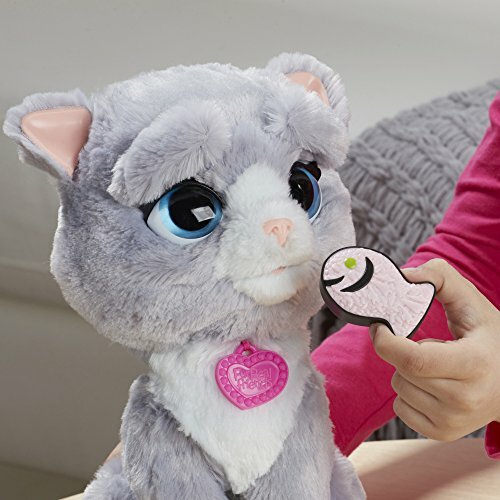 The off switch is located underneath the toy, so be sure to switch Bootsie off if she’s not being played with. Or use her to play pranks on loved ones during the night. Whichever. Bootsie is a responsive toy cat. She changes her expression by moving her eyebrows and makes various cat noises to indicate her mood. Using motion and touch sensors, Bootsie responds to being hugged, petted on her back, chest, and head. She doesn’t like having her mouth or nose flicked, and will angrily hiss if this action is quickly done twice in a row. 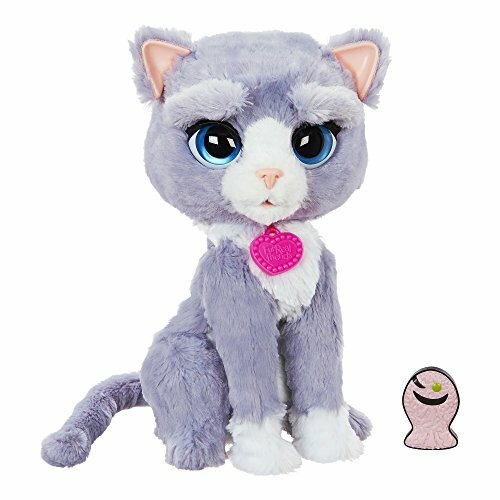 Interact with Bootsie to learn what makes her happy. 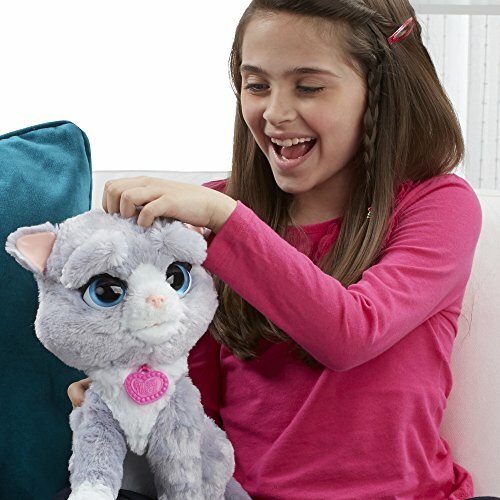 Hug her to make her purr, pet her head or back to make her meow happily, or flick her nose to make her hiss. Bootsie will also respond to her fish treat being put next to her mouth. Bootsie arrives set to the demo mode, which is problematic if you’re planning on giving this toy as a surprise gift. While in the demo mode, the toy’s responses are limited, but her light and motion sensors are not. When these sensors are activated, Bootsie will meow and hiss. Mostly hiss. If Bootsie is hidden away in a closet, she will hiss every time that closet door is opened or anything near her moved. So again, if she’s meant to be a surprise, unbox her and turn her completely off via the switch hidden under a Velcro flap on the bottom of the toy. This may make her difficult to wrap up again, but it’s better than sounding like there is a very frustrated cat trapped somewhere in your house. Once out and ready to play, be sure to switch her to ON instead of leaving her on the demo mode. This will ensure that she does more than just hiss at people. Bootsie’s movements are contained to her facial expressions, which go from sweet to sassy. Her eyebrows move while she makes various sounds. Her legs can be moved so that she can sit, rest on her belly, or lay over a shoulder. Unfortunately, she’s not nearly as soft or cuddly as most would want from a children’s toy. It’s pretty much fake fur over hard plastic. Still, this seems to upset more adults than kids, and kids still carry her around without being bothered. Squeezing her chest/belly area will cause Bootsie to purr affectionately, which is what most of the kids seem to be into. 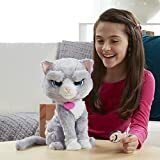 Bootsie will hiss when displeased, which means kids will have to learn the ways she likes and dislikes being interacted with. For instance, flicking her nose twice will result in her making a very angry noise, but petting her back will make her happy. Because of this, we are going to give Bootsie a higher Social score since kids have to learn how to get along instead of just doing whatever they want. Most users say that kids between the ages of 5 to 8 like Bootsie best, though some kids on either side of this range may also take a liking. Just depends on the kid. Overall, kids who enjoy baby dolls or stuffed animals that make noise will likely really enjoy Bootsie. Bootsie may be too talkative for some. If not turned off via the switch on the bottom of the toy underneath a Velcro flap, she will make noises (mostly hissing) whenever someone walks by or turns on a light near here. Just turn off her switch when not in use and she’ll stay quiet.